The collaboration between Leica and the non-profit-making organisation Kinderlachen e.V. has certainly paid off. 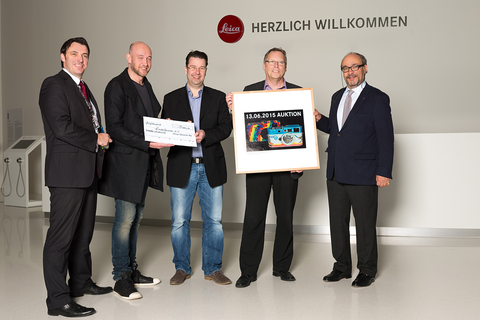 On the afternoon of 26 March 2015, Leica’s chairman Dr Andreas Kaufmann presented the CEO of Kinderlachen e.V., Christian Vosseler, with a cheque for 5,000 Euros. The money was raised through a series of fundraising events organised by the company, such as the Leica Academy Experience Days in November 2014. Some 2,500 Euros were donated, which the company then doubled for Kinderlachen e.V. to put to good use. One of the projects that will benefit is the further construction of a football pitch in Kreuzberg, Berlin. The two unique Leica models were created as part of a Kinderlachen e.V. project with children in Dortmund. 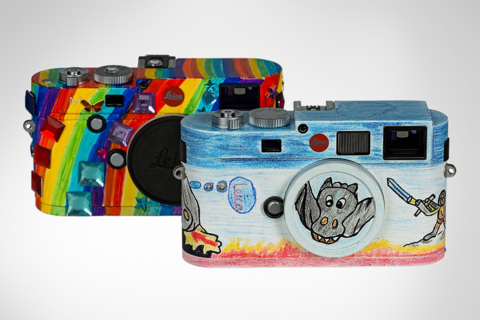 The children were given cardboard versions of the Leica M rangefinder camera, which they were free to paint and decorate as they pleased. The result was 140 paper works of art, which are still exhibited at the Leitz Park in Wetzlar. In return for the vivid designs, the company chose two cardboard cameras that served as a template for the Munich-based artist Helmut Lutter to transform real Leica products to yield two remarkable and truly unique Leica rangefinder cameras. Keep up to date with #kinderlachen and follow the latest news and reports about the auction. Learn more about the cooperation in an interview with Christian Vosseler and Marc Peine on the Leica Blog.